A description and explanation of the blind spot in the human eye, including exercises for finding and mapping your own blind spot. These exercises work very well on a computer display, and moderately well on a projector screen in front of a class. Lecture slides with images are attached. Fig. 1: Schematic of how the visual image is formed in the eye. Light rays from the object are focused by the cornea and the eye lens to project an inverted image on the retina at the back of the eye. The image information is carried by the optic nerve out of the eye through a hole in the retina. Fig. 2: Photograph of a human retina. The dark spot in the center of the image is the fovea, where the photosensitive cells are most dense. The optic nerve connects at the bright yellow area on the right, where the blood vessels converge, and where there are no photosensitive cells. Image made available by Alexander Churkin via Wikimedia Commons under the GNU Free Documentation License. Fig. 3: Keep your eye on the ball. Animation to identify your blind spot. Click on the thumbnail image to start. Instructions are in the text. Requires Flash Player. Figure 1 shows a diagram of how an image is formed in the eye. Light rays from the object are focused by the cornea and the eyelens to produce an inverted image on the retina at the back of the eye. The retina is made up of a thin sheet of light-sensitive cells that respond to the light shining on them. 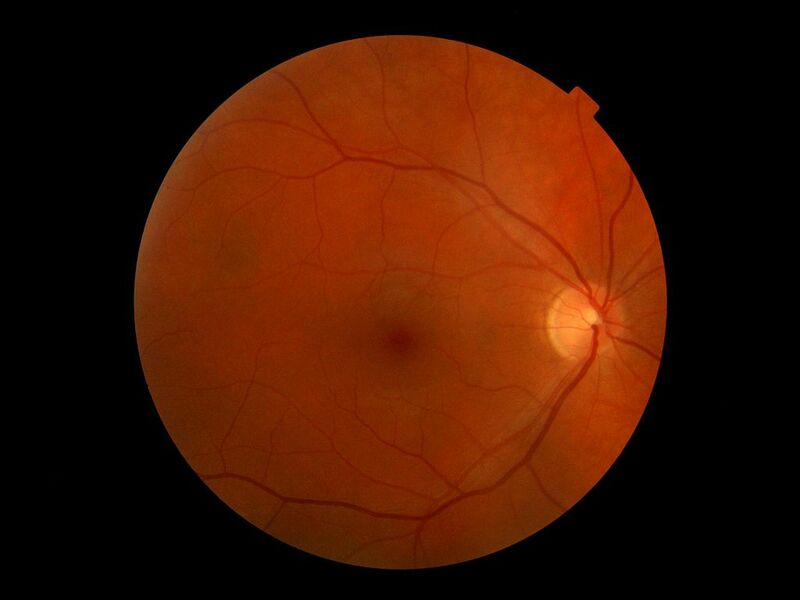 Figure 2 shows a photograph of a human retina. The retina is covered in photosensitive cells called "rods" and "cones", which generate a chemical signal whenever light shines on them. That chemical signal is passed to nearby neurons, which in turn produce their own signals that travel along neural fibers to a hole in the back of the retina. There, all the fibers gather together to form the optic nerve, which continues out of the eye and on to the visual cortex in the brain. The brain collects these signals and uses them to construct a perception of what the eye is seeing. The location where the optic nerve leaves the eye is visible as the bright yellow region in figure 2. In this region, there are no photosensitive cells and therefore no perception of the visual image, producing what is called the "blind spot". You can find the blind spot in your own eye using the interactive demo in figure 3. Click on the thumbnail image to bring up the demo. Sit about half a meter from the screen and close your left eye. Stare at the cue ball with your right eye and watch the eight ball using your peripheral vision as it rolls across the screen. Be sure to keep your eye on the cue ball and not let it wander. At some point the eight ball should vanish from your peripheral view. At that point the image of eight ball on the retina is over the blind spot, where there are no photoreceptors. 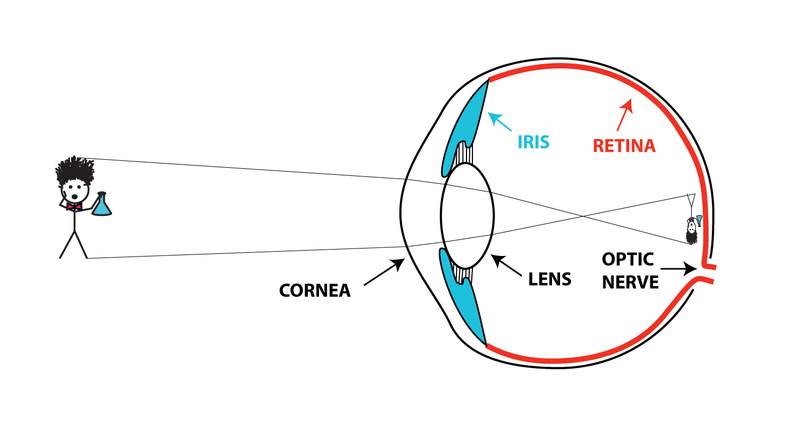 The fact that the blind spot is toward the outside of the field of view indicates that the optic nerve connects to the retina on the inside, nearest the nose. Count the seconds before the eight ball reappears to get an idea of the size of the blind spot. The blind spot in our vision is always present, but rarely noticed. Each eye has its own blind spot, which produces a gap in our visual perception, but the two blind spots from the two eyes do not overlap. Therefore, what one eye misses, the other eye does not. Generally, you can only notice the blind spot by closing one eye. Rumor has it that Charles II of England was fond of looking sideways at condemned prisoners in order to make them appear headless ... before their heads were removed in real life.1 Students are encouraged to try to make their teacher appear headless in the same manner. Video by Richard Wiseman showing how the brain sometimes fills in the missing portion of the image caused by the blind spot. Even when one eye is closed, the brain is very good at interpolating across the gap in our vision. It fills in the void with whatever surrounds it in order to make the field of view appear consistent. Usually, the brain will match the color and pattern surrounding the blind spot, be it stripes, polka dots or plaid. The video above by Richard Wiseman demonstrates how deft the brain is at generating the illusion of visual continuity. Once you watch this video, you may never trust what you see again. There are many online demonstrations involving the blind spot. One of the best I've seen is by Jeffrey Oristaglio and Paul Grobstein at Bryn Mawr College, which allows you to map the shape and size of your own blind spot. Be sure to check out their full series of blind spot images, which demonstrate several subtle ways in which the brain handles the blind spot.